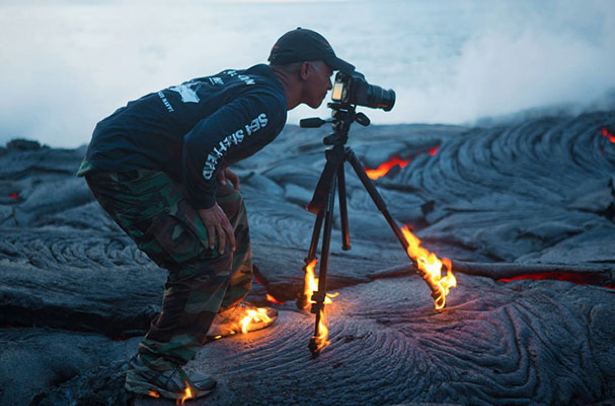 Kawika Singson is a Hawaiian-born “lava-enthusiast” photographer who risks his life to take close-up photos of flowing lava. He walks on mostly-cooled, but still very hot, surfaces to take his pictures. The video above shows him running through the lava field. Singson’s run through the lava is just one part of his seven-mile hike that leads to the active flow. He usually starts his journey at night, so he can clearly see the orange glow of the lava beneath him. His decades of lava running and living on Hawaii has made him an expert in this extremely dangerous and niche hobby that most people should never try, as Singson is at pains to point out. I definitely feel that this athletic, life-threatening achievement is definitely worthy of applause and admiration. It may not be as highly skilled as traditional sports competitions, but it is a lot more unique and memorable than many of them.